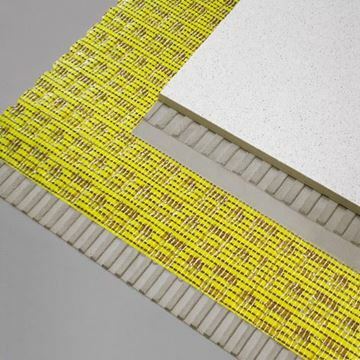 This 3-layer matting system is designed to make renovation tiling jobs easier. Instead of worrying about whether the floor you will be laying tiles onto is in good enough condition, you can just lay down Durabase matting. It will bridge all cracks and boasts unbeatable shearing force protection to ensure that you can just go straight ahead and begin tiling confidently, once the matting is laid. Quick and easy installation means that jobs which would have taken a lot of time and work can now be started and finished with ease and speed. Dural have spent several years perfecting the design of this matting to ensure that it gives you the best possible finish to your tiling job. They work with contractors and DIY enthusiasts to iron out any problems as quickly as possible in testing. In conjunction with tiles, this matting serves to decouple the tiles and bridge any cracks. It also decouples the flooring from the foundations. Any small cracks can also be bridged so that they do not affect the tiling – making it ideal for renovation work. It is designed to alleviate stress caused by lateral movement within substrates normally viewed as unstable. These include green screeds where shrinkage is still occurring, fresh power floated concrete floors, and timber based substrate (chipboard, floorboards, particleboard, MDF, metal surfaces, and asphalt). Normally, applying a rigid floor covering to such surfaces would be a difficult task because the lateral movement of such surfaces would cause tiles to de-bond or crack. However, with this matting this problem can be fixed and satisfactory results are attainable. Durabase is a contractor’s best friend in several different scenarios. If the subfloor has existing cracks, the movement and stress that this causes can create cracks in any new coverings. This is not the case with this matting from Dural, which absorbs any stress and prevents it from affecting anything on top. Concrete floors will shrink and expand for a period after installation, but this product will make sure that this cannot cause any damage. Floors will often shrink and expand, depending on the temperature, and the advent of heated floors is only exacerbating this issue. Durabase is perfect for heated floors because it will absorb the changes. Damp is another problem solved by this wonder product. Trapped moisture can be a serious issue for floors, causing damage to adhesives and allowing mould to grow. With this matting, moisture is allowed to escape through air channels in a controlled fashion, preventing buildup. It also compensates for any water pressure. Come to one of our East Midlands showrooms in South Normanton or Derby to see Durabase for yourself, and see how it can help you get the best possible finish for your job. Chat to the friendly Tile Town team about your tiling plans and we’ll be happy to offer and assistance or advice if you’re having issues.